Ayurveda (translated as “holistic knowledge of life”) incorporates a scientific system of medicine aimed at restoring total well-being through cleansing and rejuvenation – Panchakarma. This classical method of detoxification removes the cause of an illness and corrects the imbalance of the 3 bio-energies of Vata, Pitta and Kapha. Purvakarma (Pre-treatment) – Transports toxic substances within the body to places from which they can be expelled via the natural body openings during the cleansing process. 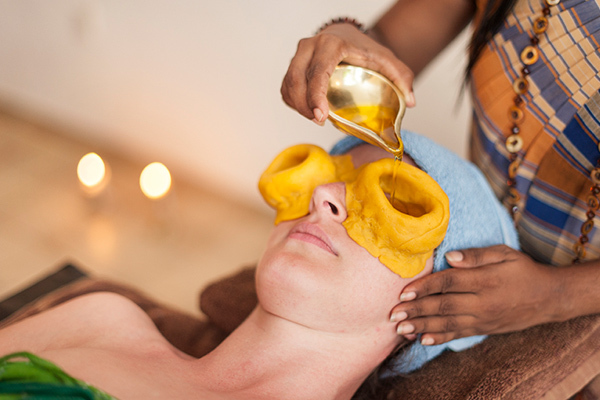 This stage includes snehanam (internal oleation) steam and massages with specific oils. It is important that this process is fully done otherwise the cleansing process will not be complete and the body will not be rid of its toxins. Pradhanakarma (Primary-treatment) – The actual elimination of the toxic substances via vasti, virechena, nasya and vamana. Some of these treatments require dietary restrictions in order to work efficiently. Pashtatakarma (Post-treatment) – Includes dietary adjustments, regeneration therapies and medicines. It is important that a panchakarma cure is administered in these 3 stages as prescribed in the classical texts on Ayurveda. A few massages given in a haphazard way or treatments such as virechena given without the necessary pre-preparation of snehanam does not give a complete detoxification and could even result in unpleasant side-effects. At Surya Lanka we practice classic, authentic Panchakarma in Sri Lanka. We offer 3 levels of Panchakarma cure. Each level is comprehensive, result oriented; responsive to each guest’s needs and individual medical condition; administered by a team of highly professional, caring doctors and therapists.